For Srivaishnavaites, margazhi has added significance – there would be Adhyayana Uthsavam and during the month the Thiruppavai of Andal is recited in the morning. Andal composed two works unique in their literary, philosophical, religious, and artistic content. One is Tiruppavai, a composition of thirty verses in which Andal imagines herself to be a cowherd girl during the incarnation of Lord Krishna. The second is the Nachiyar Tirumozhi, comprising of 143 verses. Thinking of Sriman Narayana and surrendering at the Lotus feet of Lord Narayana only will lead to us salvation. In 30 beautiful pasurams, Andal eulogies Lord Sriman Narayana showing us the way to get near the lotus feet of Lord. The Dhanur masam [month of Margazhi] is replete with kalakshepams ~ renditions of many great Athikaris, explaining in detail the works of Azhwargal and Purva Acharyas in nice, coherent, easily comprehensible manner. 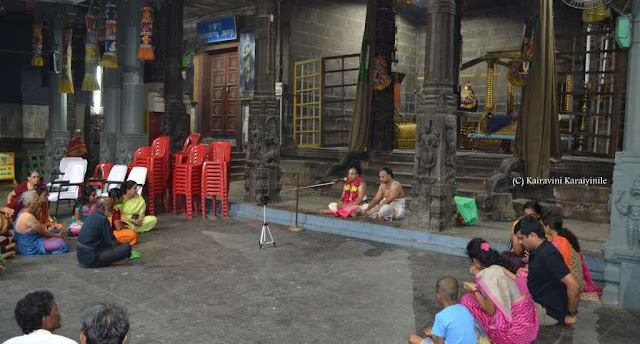 While listing those Kalakshepa Athikaris is not easy, there are so many in Triplicane that Triplicaniites have the pleasure of hearing to them so often. This year at Sri Parthasarathi Swami temple – it is Thiruppavai upanyasam by Sri Sadajith. He is a young kid – but people are not really surprised at his articulation, mainly because he has been rendering kalakshepams from a young age of 7 ~ I first heard and wrote about him in Jan 2013. People who have heard many Swamins, authorities on Thiruppavai kalakshepam too gather to hear Sri Sadajith. This morning it was nice articulation when heard from outside and those seeing him for the first time would be wonder-struck seeing his youthful exuberance. 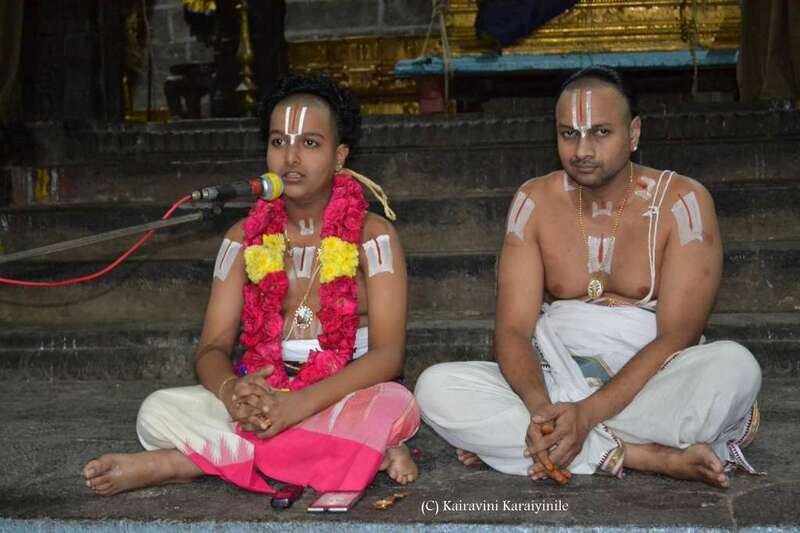 Sri Sadajith @ Geethacharyan has a rich lineage; his father Sri Elayavalli Sriram Swami also performs kalakshepams; more famous is his grand father Sri U.Ve. Elayavalli Bhoovaragachariyar Swami. Understand that his great grandfather Sri Sadagopachariyar was also a famous kalakshepa adhikari. For many parents, a child speaking few words itself is a wonder ~ but here is a child orating, words flowing unhindered ~ dispensing out so much of information that some of us may never get even in our entire lifehood – all from age 7. Here are some photos of Sri Sadajith at Thiruvallikkeni thirukovil alongside his father Sri Elayavalli Sriram Swami.